Key Difference: Aim is setting a determined course in order to achieve a set target. Aims are usually long term. Aims can be called as long-term goals. Aims determine a set course or a target at the end that a person wants to reach. Objective is actually a part of goal. Objectives are more concrete and are clearly defined by certain steps that will eventually allow the person to fulfill that particular goal. Aim and objectives are two terms that are often confused as the same thing and used interchangeably. However, these are two different terms and are used in different contexts and refer to different things. Aim refers to a determine course of action, while objective refers to clearly defined steps that will eventually allow the person to fulfill that particular goal. Aim is setting a determined course in order to achieve a set target. Aims are usually long term. Aims can be called as long-term goals. 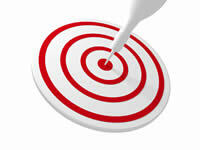 Aims determine a set course or a target at the end that a person wants to reach. Aim can also be used to describe how determined a person is to reach a certain point in their life. Aims require determination and persistence, it requires that the person stay on a set path and complete the requirements to reach that aim at the end. Aim is pretty vague and does not state what the person will do, it just states what a person wants or sees at the end of the line. An example of aim includes: The person aims to acquire the required doctorate to become a doctor. Objective is actually a part of goal. 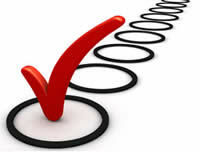 The term objective refers to set tasks or goals that a person wishes to accomplish. Objectives are more concrete and are clearly defined by certain steps that will eventually allow the person to fulfill that particular goal. Objectives can be termed as small guidelines that help achieve the goal at hand. They can also be used for motivation purposes. Objectives are often short term and have a limited amount of time frame. They have three parts to it: what the person wants to do, the time frame required and the resources he plans to use. These three things can be answered in an objective. Objectives are also much easier to measure than goals. It asks only if the person finished what he wanted to in the amount of time he had set aside. Objectives can be considered as being more realistic. Something that one's efforts or actions are intended to attain or accomplish; purpose; goal; target. While aim determines what the person wants and what he intends to do, objectives determine how is will do that. Objectives paint the picture for achieving the aim. It helps the person stay on course to finally fulfill the aim. If objectives are not there, the person may stray from the path and achieving the aim becomes much harder. It can be said that objectives provide a mean and shows the way to achieving the aim or goal.